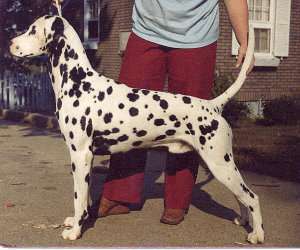 Paisley Dalmatians is pleased to present "Ko" Ch. Long Last Living Legend. 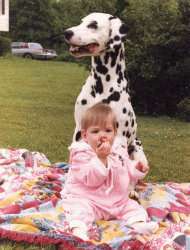 Ko was a gentle good-natured dog, wonderful with children, and the irreplaceable companion of his owner Kitty Brown. He was an excellent sire, producing 26 champions, and lives on in the pedigrees of many of today's winners, producers, and beloved companions. 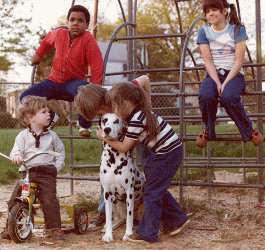 Ko is pictured below hanging around with friends (that's Todd Brown on the bike), and babysitting for Kitty's daughter Jessie.